Twitterverse is a visualization and mashup that mines and archives the public timeline of Twitter and aggregates the most commonly used words in a given time period. We created Twitterverse when Twitter was still in its infancy and primarily used by geeks. We wrote some custom scripts to run through the public timeline and produce tag clouds of the most popular words at given time periods (1 hour, 5 hours, 10 hours, all day). 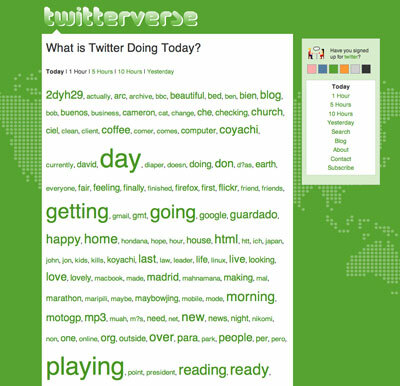 Twitterverse was an ever-changing repository of topics: real-time, archived and searchable. 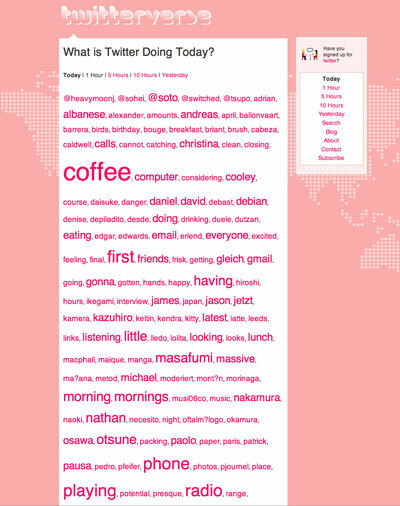 Today on Twitter, the concept lives on in the form of trending topics and search. At the moment, you can see topics by geographic region. Hopefully, one day we’ll be able to see popular topics from a group of friends or by list. Thanks to MashupAwards for awarding Twitterverse the mashup of the day. Twitterverse is an Ideacodes Labs project which and provides a visualization of the most commonly used words in a given time period from the Twitter public timeline. MashupAwards is a hand-picked showcase of the best web mashups based on uniqueness, creativity, utility, content and user experience. 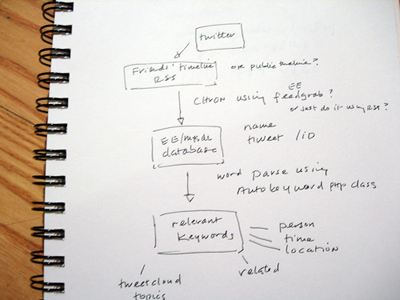 In Idea To Execution: The Team Behind Twitterverse at Wired’s Epicenter blog, Adario Strange writes: “Snooping around the web I found this interesting early idea sketch from the creators of Twitterverse (see below). Over the weekend I got in touch with web designer and Twitterverse co-creator Emily Chang of Ideacodes for an explanation…”I did the sketch in March as my partner, Max Kiesler, and I were debating a Twitter mashup called Twitterverse. It’s an experiment we’re doing in our free time to mine and archive the public timeline show popular words and phrases from Twitter.” See the post at Wired. You can also see other news at the Twitterverse blog.